The last Honolulu NightMarket of 2014, Rogue Christmas. LS is as Rogue as the term goes. So might as well use the only Rogue we know. The Crap Kids will be in the house & our old friends Fumanchu, 3xOG’s is breaking silence from monk status to be slangin’ that dope threds. DJ Enjay, DJ Kutz, & KTC will be in the mix. So good people, food, an vibes all around. Don’t Sleep. The 2nd DunkxChange of 2014 has laced up. Here is a recap brought to you by Hawaii Sneaker Heads. 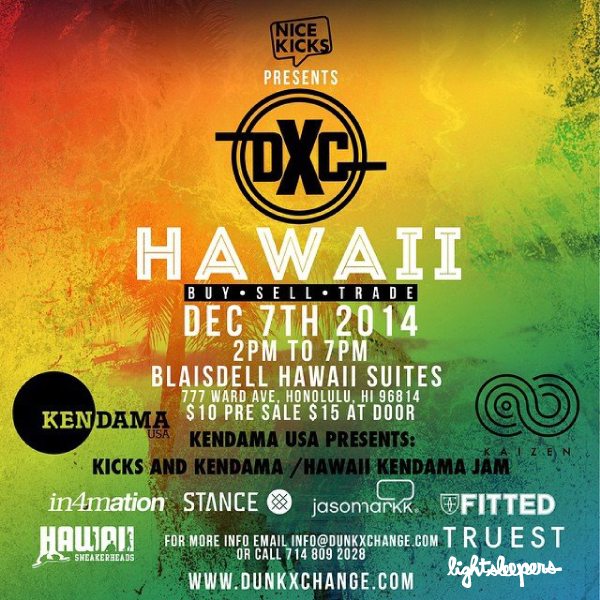 Big ups to Gary & Curtis for bringing DxC to Hawaii, especially all of Hawaii for the support. It take locals to be the roots of an event like this. Mahalos. Don’t Sleep. Back by Popular Demand. Nah fo’ real, all the heads that copped this shirt and all those that didn’t have been waiting for the reup. We will be releasing these tees on line friday night and in store the week after. Thank you for the continue support, you could be rocking any where but you rocking wit us. Not Sleepin’. Mahalo to DunkxChange for another dope event. Got to chop it up with a grip of new homies and old friends. We go great news dealing with INERTiA 11 in 2015. Big ups Gary & Curtis, always fun. Don’t Sneak the Technique. The DunkxChange is back and ready for all you shoe, kicks, sneakers, flo Joes, slippers, and old Filipino Tata slipon, wearers. We will be posted up with Truest Hawaii, Crappy Kids, and my OG homie JYC. Hopefully, we will have a few new goods for you to cop-age. Don’t Sleep. El-P & Killer Mike is Run the Jewels. Saving Hip-Hop with every track. And saving our brains from dumb rap. Run it. One day we might be a big business, until that day comes please support us today (Saturday) at ART & FLEA’s event called UNCUT, 8am to 12pm, Ward Warehouse. & online at shop.lightsleepers.net. Don’t forget to use the hook up code CYBERTRON14 at check out. Mahalo for all the support and hope to see you at one of our events or on the interwebs. Don’t Sleep.